28 July 1935 - t.b.a. more or less confined there until the invention of the railways.
" Know thine hours, but waste them not ! " Born in the home of my maternal grandmother at 25 Bosworth St, Openshaw, Manchester [M11 3AW] she delivered the baby and nipped out for ice creams etc. The house was demolished in 2009 as part of a redevelopment. 1936 Aug. The family moved to 21 Broadstone Rd, Stockport, to take over a beer-shop, the Long Pull, previously managed by paternal grandfather until his death. My grandfather's funeral happened to be on my 1st birthday. 1939 My brother Barrie was born. 1939 - 1945 WWII, and my Dad went into the R.A.F. 1940 September This was the time of The Battle of Britain, and also Geoff's first days in school at Longford Road, Reddish, Stockport. There were air-raid drills, and gas-masks for children and staff from day-one ! Apparently diving under the desks would have protected us from the bombers. 1944 Friday (evening) February 18 : My first choir-practice at St.Elisabeth's church, Reddish. Mr.Wright was the organist and choir-master. 1944 Saturday February 19 : My first pianoforte lesson with Harold English. He was the assistant organist at St.Elisabeth's and an old friend of my Dad. 1944 May 29 : It was Whit-Monday and the day of the annual St.Elisabeth's choir picnic, quite a novelty for an eight year old to be out and about with 'strangers'. The venues of those picnics were never the same and might have been anywhere within 50 miles of Reddish. I do remember Southport; Blackpool and Llandudno but this first one has suddenly become signficant as the venue Belle Vue Zoo and Funfair was swarming with U.S. Army G.I.s. Those G.I.s could not have known that D-Day was only 8 days away. And the primitive historian in me suspects that for reasons of secrecy and security, many, many foreign troops were billeted well away from England's south coast until the eleventh hour. 1945 Wednesday May 8 : VE day (Victory in Europe) i.e. Invasion to Victory was 48 weeks. 1945 September 27 Dad was released from the R.A.F. to continue family life with Dora, Geoff and Barrie. 1945 This line is reserved for my first bike (crate, grid-iron, ger-off-and-milk-it etc etc). A diety named Hercules had something to do with its invention. 1946/spring Due to a fall on broken glass while playing, I suffered a serious injury to my writing-hand. An artery and tendons were severed. I wish I could go back in time to Stockport Infirmary and thank those good people who eventually repaired the damage. I remember I was treated at the time with M&B antibacterial tablets, forerunners of what we now recognise as antibiotics which were a godsend for war wounded. 1948 My brother Philip was born. 1949 - 1952 Attended Stockport Technical School as an "engineer". Students chose to specialise either as builders or engineers and were streamed accordingly. 1952 Aug 30 (Saturday) First flight of the Avro 698 (prototype Vulcan) at Woodford Aerodrome. Among the observers at Flight-Sheds were chief design engineer Mr Stuart Davies and his daughter Susan age 12. 1952 Aug 31 (Sunday) "A last minute rush to prepare the new Avro 698 four-jet delta bomber for display at the S.B.A.C. Airshow took the wind out of the North Western Area's sails by causing the postponement of their popular (aero-modeller) rally, sponsored each year by the "Manchester Daily Dispatch." The foregoing quotation is from the Aero Modeller magazine of November 1952, pp. 648-649. The webmaster was one of the disappointed aero-modellers at A.V.Roe's main gate who were turned away on the day. Also, the short notice and urgency of the cancellation are illustrated by the fact that on the Saturday "- - the BBC added an announcement in their Regional Broadcast - -". 1952 Sept - 1958 Aug I was enrolled as an apprentice draughtsman at Craven Brothers (Manchester) Ltd. We built very large machines for metal cutting/and grinding. Those six years included HNC Mech.Eng at Stockport College. In those days the closest we got to a degree/cap-and-gown, or even a 'reference' was advice from the management to "Just tell 'em where you're from lad !" So, no apology from me for conflating the HNC qualification. I was presented with my long service award at A.V.Roe by the then managing director Norman Barber who told us in his speech that he was proud to suffix his name with HNC. Two years National Service in the Royal Air Force. which assisted pilots when about to land, forerunner of ILS. Those 'radars' were namely : Eureka; Babs; and Tacan. the air-borne counterpart equipment known as Rebecca. R.A.F. Chaplains School (Anglican), Dowdeswell Court, Cheltenham. Here is another airman's account of his time at R.A.F. Locking. 1959 Oct 17 Dorothy and I were married at Reddish Green Church, Broadstone Road, Reddish, Stockport. 1962 & 1965 Our sons John and Tony were born. 1976 Apr 30 Licensed as a Radio Amateur, callsign : G4FAS (the G = England, U.K.) On radio frequencies up to 29.7 MHz (10 metres wavelength) I met many other 'radio-hams' in more than 100 countries, communicating mainly in Morse code. 1961 - 1993 Employed by the A.V.Roe company, Woodford, Cheshire as a design draughtsman, stayed there until retiring as a principal design engineer. Was involved in the construction, modification and restoration of many types of aircraft, e.g. Anson [G-AHKX]; Shackleton; Vulcan; 748/ATP; Nimrod; Victor [ex Handley Page]; VC10 [ex Vickers]. Over the years the company name went through a number of transformations. As a design; assembly; and flight test facility, the Woodford site closed on Friday 28th of October 2011.
kindly provided other photos for the walls of my office. together with endearing remarks by his grandson. e.g. Cygnus A; M1 the Crab Nebula; M87 Virgo 'A'; and Cassiopeia 'A'. and handicraft, for me alone perhaps, an ideal retirement project. as radio foghorn 'Cygnus A' slipped steadily westwards. A few weeks prior the above Shawbury event I had retired from Woodford on September 30th and it so happened that a farewell tour of Britain by Victor-tanker XH672 had been arranged for the same day - - - so together with friends and collegues I enjoyed the sight of a very quiet fly-past as the plane skimmed fast and low across the airfield and away - - - it was as though 'someone-up-there’ knew that I was about to 'clock-out' for the very last time. 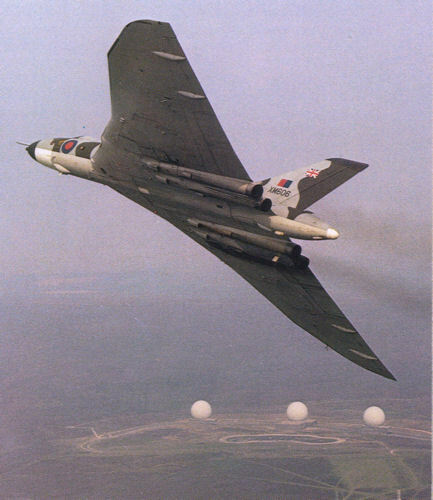 Historical note for reference, re May Day 1982 The above mentioned Victor XH672 was one of eleven tankers which enabled the attack by RAF Vulcan XM607 on the Argentinian held, Port Stanley. XH672's fuel delivery was the last one of eight, then the Vulcan set course for end of the epic flight at RAF Ascension. 2010 Feb 25 One of my A.V.Roe, Woodford colleagues Humphrey Chetwood MSc, engineer, died aged 87. As a boy he attended Cheadle Hulme School. About 1940, in the heat the of Battle of Britain he joined the A.V.Roe company as a draughtsman. He worked on Lancaster bomber development, presumably under the direction of Stuart Duncan-Davies. Humphrey was my immediate superior throughout the 1970s during which time the Woodford team converted HP Victor-bombers to Victor-tankers. Those tankers were to play an important role in the Black-Buck operation which enabled the defeat of insurgents on the Falkland Islands in 1982.
he ponders the task of installing a flight-refuelling unit under the tail of a Vulcan.